"MAMA THAT THERE EGG WON'T GET OFFA' HIS FACE! CAN WE ENTER HIM IN THE FAIR?" Here we go, part two. This is what you get when you have extra waffle batter that needs to be used up, and regrets over not making Biscuits and Gravy. Regrets that keep you up at night. Huge ones. But really, these particular waffles are perfect for savory applications - the cornmeal and yeast and overnight rise make this a BAM POW full-flavored waffle, with the butter in the batter as well as what you brush on the grill before cooking crisping and caramelizing the edges beyond perfection. These waffles are so good you could eat them plain, and I advise you to try a bite before you top them. Go on. Gnaw it up. And then top them like crazy. So many options are out there - I thought about chili, and then I thought about balsamic strawberries with vanilla ice cream. But those Biscuits and Gravy would not leave my mind, so it was time to get weird. This is a peppery, umami-rich vegetable gravy, enriched with a little half and half and brightened with lots of fresh green herbs - rosemary, parsley, chives and scallions. After you sling it on top of the waffles, you slide a basted over-easy/medium egg on top and dot with some sauteed mushroom halves, more herbs and then you get real. This is a rich, unctuous meal, that will cling to your innards and belly. I don't know if I can advise you to serve it for breakfast, if you have hopes to eat again that day. But it is very, very nice. So below is the recipe for the gravy. The master waffle recipe is one post back, and no changes are neccessary. I made this version the morning after, so I store the leftover batter in the fridge - they were still wonderful, but next time I'd 'Waffle Up' all the batter, freeze or ziploc any leftover waffles and then toast them up in the toaster or oven the next morning. Dice mushroom caps and stems into small pieces and sauté in the butter/oil until golden brown and a little crispy– I also held a couple mushrooms back and sliced them in half, then cooked those halves before the rest to use as a garnish. Season with a dash of salt and pepper. Using a slotted spoon, remove the mushrooms and since mushrooms are greedy and hateful and delicious, and soak it all up before anyone else has had a turn, add a bit more fat if needed – for the gravy, you want to have around 2 or 3 Tablespoons of fat in the pan. Drop in the minced rosemary and red pepper flakes. Immediately add the onion, garlic and diced red pepper. Saute until soft and lightly golden, then add the flour and stir around until flour has coated the vegetables and turn golden brown. Slowly add the chicken broth and whisk gently, scraping up brown bits, until you have a smooth, thick gravy. For the egg, I’d suggest you fry it or prepare it however you see fit or feel comfortable with. I stick to the small nonstick pan, a little butter or olive oil or fat of any kind, a quick crack and then let it sputter over medium heat. For this presentation I basted the yolk and top whites with some of the hot fat, and that warmed the yolk and set the whites so that they wouldn’t quiver. To serve, stack one or two waffles on each plate. Top with gravy, then place the egg on top and garnish with parsley, any reserved mushrooms and more chives. Store leftover gravy in the fridge or freezer. Not the shed, or your pockets. Holy crap that looks amazing, woman! 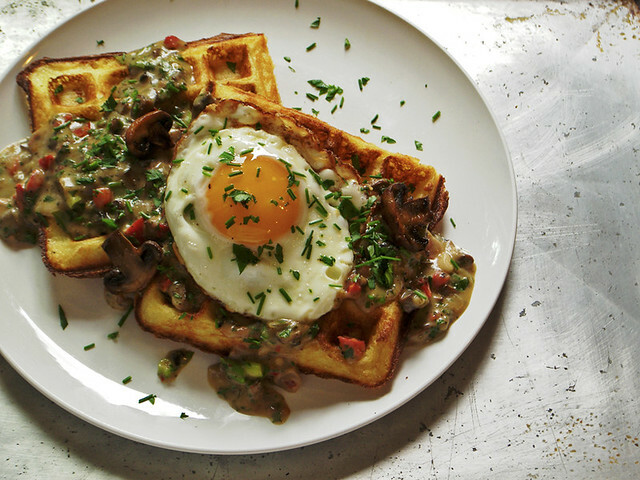 I'm not a huge fan of waffles save for a good Belgian waffle or two but- savory waffles?! I could hug you. This looks delicious! I've never really encountered waffles with savory toppings in England but fried eggs with anything = winner in my book! This sounds fan flipping tastic! Have you been to the Waffle Window in Portland? They serve delicious cheap waffles with great savory toppings. (I swear that I don't work for them or anything, but I'll understand if you delete my comment) Spam is for musubi not blogs!